When we think of cooktops, electric and gas immediately come to mind. However, there is a new up and coming technology that is winning home cooks over by the minute. It’s called induction. Electric and gas cooktops heat up their burner first and then transfer that heat into the cookware. This can waste a lot of time and heat. Induction cooktops, on the other hand, use an electromagnetic field below the glass surface. 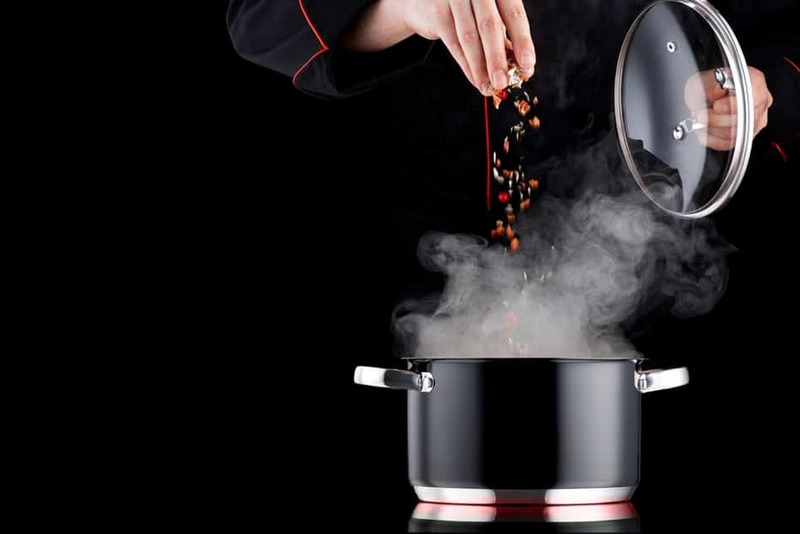 This transfers electrical currents to induction compatible cookware, which creates heat. This is the main reason why induction cooktops have become so popular – they cook fast and respond faster to temperature changes. This saves you time in the kitchen and prevents burning your food. Additionally, they are quite affordable, energy efficient, and they have a lot of safety features. The safety features are especially appealing to those with kids. One of the main drawbacks of this type of cooktop is that you are required to have an induction compatible cookware set. While some are compatible with induction, most are not. What makes a set of cookware induction compatible is if the bottom is magnetic. Typically, if you are able to attach a magnet to the bottom of your pot and pan, it should work. However, it is best to contact the manufacturer to ensure that it is truly induction ready to avoid any injuries or damages. In this review, we will introduce you to the top five induction ready cookware sets. We’ll thoroughly discuss some of their benefits, downfalls, and additional features. T-fal is a brand that has been making its way into kitchens since the 1950’s, and they show no signs of slowing down anytime soon. The T-fal 13-piece, stainless steel cookware set with a copper bottom is one of the most frequently purchased cookware sets available today. There are plenty of reasons why it has become so popular. This cookware set is made out of 18/10 stainless steel construction which is considered the gold standard in cookware. This metal combination prevents rust, holds a shine, and is heavy duty. The cookware set is finished with a brushed stainless steel interior, which looks great. It also prevents the cookware from looking scratched up over time. The heavy bottom prevents rattling on the induction cooktop, which can sometimes cause a buzz. It is made out of stainless steel that is covering a core made out of thick gauge aluminum. There is a copper disc inside that core which helps with heat distribution to eliminate hot spots. Copper and aluminum aren’t the most magnetic materials in the world, but when combined with heavy duty stainless steel they become induction compatible. The set comes with three frying pans, three saucepans, and a stew pot plus as steamer insert. Additionally, the cookware set comes with glass lids which all contain a vent hole to let steam out. This is a small detail that is actually quite important because it prevents boiling over, which can be quite messy depending on what you are boiling. The glass lids can also trap moisture and heat throughout the cooking process. This will make your food more nutrient dense. It also allows you to keep an eye on your food without removing the lid and letting heat escape. The quality build doesn’t stop there because the stainless steel handles are riveted. This way, you can fill them up and move them around with ease. The handles are smooth and ergonomically designed so that they aren’t causing you any discomfort during the cooking process. Due to its build quality and material, it is compatible with all cooktops including induction. The cookware itself isn’t, but T-fal has suggested using the cookware at a medium heat with a small amount of oil to prevent sticking. The entire cookware set is oven safe up to 500 degrees Fahrenheit which the exception of the glass lids. It can also be placed into a dishwasher for easy clean up so you don’t have to worry that it will ruin your new set. This cookware set is one of the best on the market. It is induction compatible which is quite rare. The combination of high-quality materials, 13 essential pieces, and a good price point doesn’t get much better than this. Vremi is not a name you hear very often in the cookware world. That shouldn’t be the case for much longer because they have made an incredible cookware set that cannot be ignored. 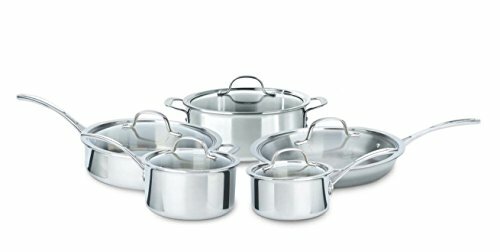 The 8 piece Vremi ceramic cookware set is a unique set that is easily one of the best non-stick induction cookware sets on the market. It was designed to not only be functional, but to be so eye-catching that it can go from stovetop to tabletop. All you need to do is use a trivet set to prevent the hot cookware from burning your tabletop. The cookware set comes in three bright and yet classic colors. They almost make you feel like you’re cooking in France back in the 1950s. These colors consist of green, blue, and yellow with white accents. The lids consist of a cream marble colored top with ergonomic wood toned handles that are as easy to grip as they are to look at. The interior of the pots and pans is cream and speckled. This adds to the overall vintage and yet modern aesthetic. These include two dutch oven pots and a casserole pot that all come with lids. 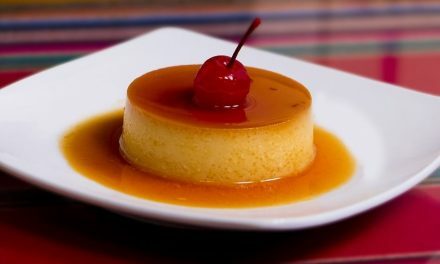 It also comes with two frying pans, which have been said to make eggs and crepes with ease. The cookware is made out of non-toxic aluminum that is coated in ceramic. Ceramic coatings provide numerous benefits such as promoting even heat distribution. Additionally, ceramic is one of the safest and healthiest non-stick cookware coatings available today. Ceramic can quickly release food without the use of a scraper and cooking oils. However, even when accidentally scraped, it will not release toxic chemicals or fumes that could harm you or your family as other non-stick coatings would. This set features a unique and yet incredibly functional steam release design. Between the lid and body of the pots, there is a small gap that allows steam to release while cooking. Additionally, this small gap will also prevent over spilling which can prevent huge messes. One of the most unique features of this cookware set is the curved construction of the pans. We all have a lot of fun in the kitchen trying to flip omelets and pancakes, but sometimes the food just sticks too hard or the design isn’t suited for flipping. 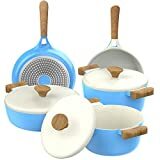 This cookware set changes all of that because the pans have been designed with a curved construction making it perfect for flipping and tossing food around. The bottom of each piece of cookware has an induction-compatible spiraled heat conductor, which will work on gas, electric, halogen, and induction cooktops. It is important to note that this set is not oven safe, however, it can be cleaned in a dishwasher. In order to protect the ceramic coating for as long as possible, they do clean up much better when hand washed with non-toxic soaps. 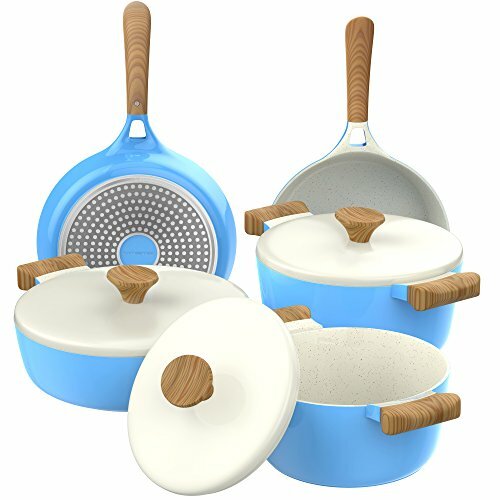 This is a beautiful cookware set that is as unique in its appearance as it is with its functions. From the steam release feature to the healthy ceramic coating and beautiful design, there aren’t many cookware sets on the market that compete with this one. Calphalon is a leading name when it comes to hard anodized cookware. On top of that, they aren’t slacking when it comes to induction ready stainless steel options. 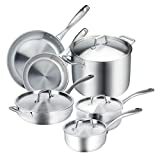 This 10-piece stainless steel cookware set is made out of a heavy duty tri-ply stainless steel that wraps a heavy gauge aluminum core. The aluminum core is placed in the bottom of the pots and pans and wraps up the sides to ensure even heat distribution. This way, you aren’t constantly moving your food around trying to chase hot spots. While stainless steel doesn’t distribute heat that well and aluminum isn’t magnetic, the two make an unbeatable combination. It makes for the perfect induction compatible cookware. This ten piece set comes with everything you need and nothing you don’t. This is a rare thing to come by these days. Whether you are looking to sear, brown, sauté, or deglaze, this set has every piece you could possibly need to get the job done. It features one omelet pan, two saucepans, one sauté pan, and a dutch oven. Each piece comes with a glass lid including the omelet pan. The tempered glass lids allow for easy monitoring of food while cooking. The handles on each pot and pan are made with cast stainless steel handles. The handles have been riveted to the base to promote safety and comfort when handling. To make it even better, this set is as stylish as it is functional. The exterior of the cookware is finished with a polished stainless steel finish while the interior is a satin finish. With cookware this attractive, you can pretty much take it off the cooktop or out of the oven and place it right on the table to serve. The entire set is dishwasher safe but would benefit from hand washing. Using gentle materials and detergents will maintain the steel’s shine. It is also oven safe so that you can place the cookware directly into the oven or broiler. It definitely comes at a higher price point than most. However, the manufacturer behind it is well known and incredibly reputable with good customer service and warranties. That all comes at a price. Additionally, you are getting a high-quality cookware set that uses carefully selected materials to ensure that it works faultlessly with all cooktops including induction. This cookware set ticks all the boxes. It is beautiful, functional, and works on induction cooktops without any hesitation. 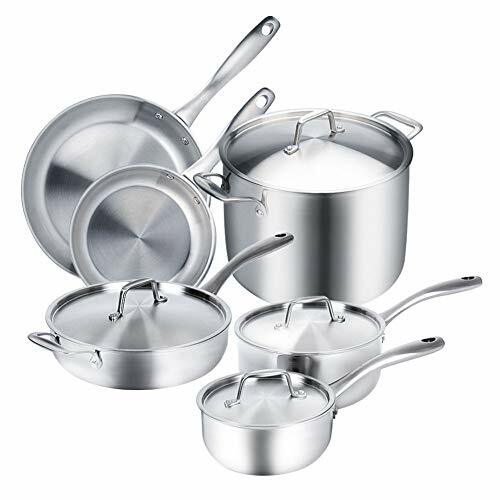 There are many cookware sets out there that are made with induction compatible materials. Additionally, there are even more cookware sets out there that are labeled induction compatible without really being designed specifically for induction. While these cookware sets will probably work just fine with induction, it can never hurt to have a cookware set that was designed specifically for an induction cooktop. This 10 piece Duxtop stainless steel cookware set might just be the best induction cookware set available. Duxtop has been leading the game when it comes to portable induction cooktops and induction ready cookware. They understand induction technology and create the impressive tools to compliment it. This set is no exception. It was designed with top of the line materials with induction technology in mind to make sure that your cooking experience is easy and efficient. The set includes two frying pans, a sauté pan, two saucepans, and a larger pot. Every piece of cookware comes with a lid except the two frying pans. 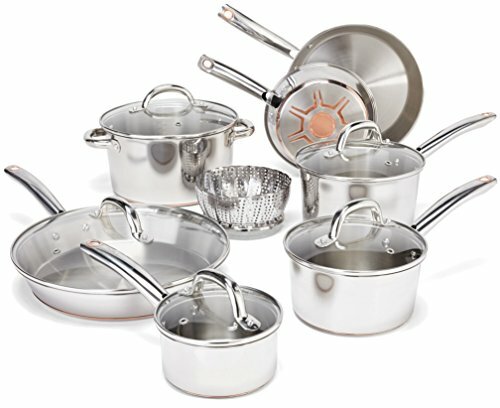 The cookware itself is made from 18/10 whole clad tri-ply stainless steel. This eliminates hot spots by promoting even heat distribution throughout the bottom and sides of the cookware. The ergonomic handles have been riveted to the pots and pans to ensure they aren’t going anywhere. They stay cool even when subjected to high levels of heat. Speaking of high heats, these pots and pans can be placed into a 550 degree Fahrenheit oven without any problems. Additionally, if you need to safely store your food and ran out of Tupperware you can store your food and cookware in the freezer. One of the main aspects of this cookware set that makes it so clearly designed for induction cooktops is the bottoms. While the entire set is made out of heavy duty stainless steel, the bottoms were made to be specifically heavy. 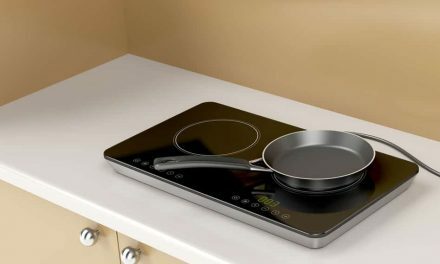 One main complaint people have with induction cooktops is the buzzing noise from the cookware rattling onto the cooktop. This is quite common and only happens because of the transfer of energy. While any good cookware set will have a heavy-duty bottom to withstand wear and tear, it can also be quite beneficial on induction cooktops. This is where Duxtop really shines and ironically, this is also the main complaint about this set – that it is too heavy. Heavy pots and pans are actually a good thing and while they might be uncomfortable to use in some instances, they are a sign of high-quality materials and durable construction. In the case of induction, the heavy bottom will keep the pot or pan grounded to the cooktop and reduce that annoying rattling or buzzing noise that so many complain about. This is a cookware set that was designed specifically for induction cooktops. It features high-quality materials and the basic features you would expect from a cookware set at a great price. When it comes to nonstick options in the induction world, you can be quite limited. There are many materials you can’t use when making a product nonstick and even more you can’t use when making a product induction compatible. This is where T-fal has really come through and changed the game. This 10 piece nonstick cookware set from T-fal is the second T-fal made set to make our top five list. That leads us to believe that T-fal is becoming a game changer in the world of induction cookware. This set is durable and scratch resistant which is one of the most appealing aspects of the set. Scratch resistance makes it really versatile because you can use the tools you already have, whether they are wood, silicone, or metal. The last thing anyone wants to do is replace their cooking utensils or constantly worry about scratching off the coating. 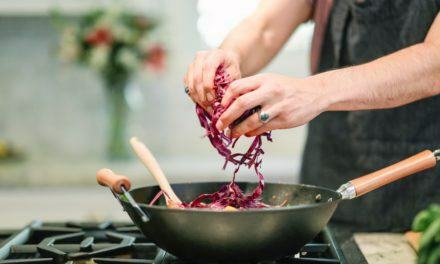 This is also beneficial because many nonstick coatings are quite toxic and when scratched they are more likely to off-gas and cause health problems. The only real problem we have with this cookware set is that T-fal hasn’t been very transparent on what their coating is made from. The nonstick coating is what they call their “Prometal pro nonstick interior” and they claim that it is a healthy and safe nonstick option. The base of the cookware is made from heavy duty stainless steel which is what makes it induction compatible, while the rest of the body is made out of aluminum. This set comes with ten pieces consisting of three sauce pots, two frying pans, and a stock pot. Every piece with the exception of the frying pans come with a tempered glass lid so you can keep a close eye on your food. T-fal is known for their Thermo-spot heat indicator that glows red when the pan is preheated. This thermo-spot indicator is incorporated on both frying pans. The handles have been ergonomically designed to ensure that you are comfortable when handling the pots and pans. They are riveted to the body of the cookware so that they don’t snap off under pressure or get too hot. Additionally, they wrap the handles in silicone which also aids in keeping the handles cool and comfortable when handling. The entire cookware set is oven safe up to 400 degrees Fahrenheit and can be placed in the dishwasher for quick and easy cleanup. This is the nonstick induction cookware set that is marked at such an appealing price point. The set doesn’t come with any extra bells or whistles, but it has two important aspects that always gets the job done. This is a simple set by T-fal that is nonstick, induction compatible, and affordable for all budgets. Induction can seem like a complex and somewhat intimidating new technology. In some cases, it is. Many people switch to induction cooktops because they are fantastic money savers. In some instances, they are more affordable than electric and gas. Over the long run they certainly pay off in their lifetime. Induction cooktops have been said to be over 50% more efficient than their competitors. Therefore, the energy savings in the long run will pay for itself. Furthermore, many people are switching their energy source to solar, wind, and other eco-friendly options. In these cases they might require a cooktop that uses less energy. The last thing anyone wants to do when getting a new cooktop is spending even more money on a new cookware set and cooking tools. 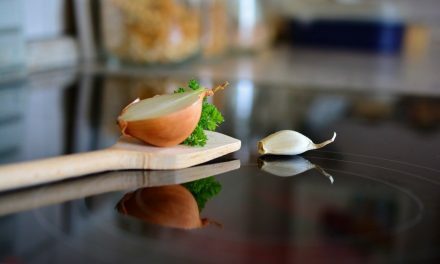 Trying to find induction cookware is hard enough, but when you are looking for additional features such as nonstick, aluminum-free, or ceramic coated, the search can be exhausting and in some cases seem impossible. Luckily for you, we have come up with a list of the best cookware sets for your induction cooktop. Whether you just got your induction cooktop or are looking to upgrade your current set, these top five options are sure to tick all your boxes. Whether you are looking for a simple set at a low cost or a high-quality set that is beautiful enough to serve food out of, we have you covered. We hope this article made your search easier and provided you with enough information to help you make a confident and informed decision.